Stay Connected. Be Informed. Find Your Way. 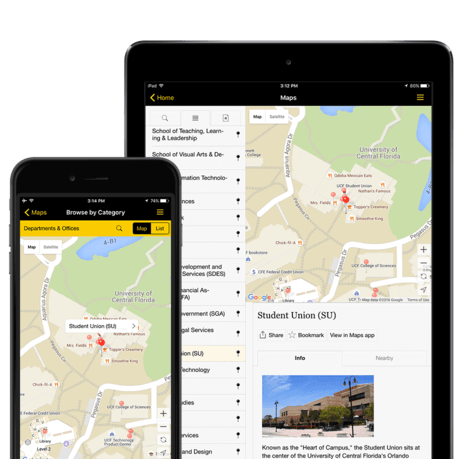 UCF on-the-go for iOS and Android. Stay connected to the things that matter. 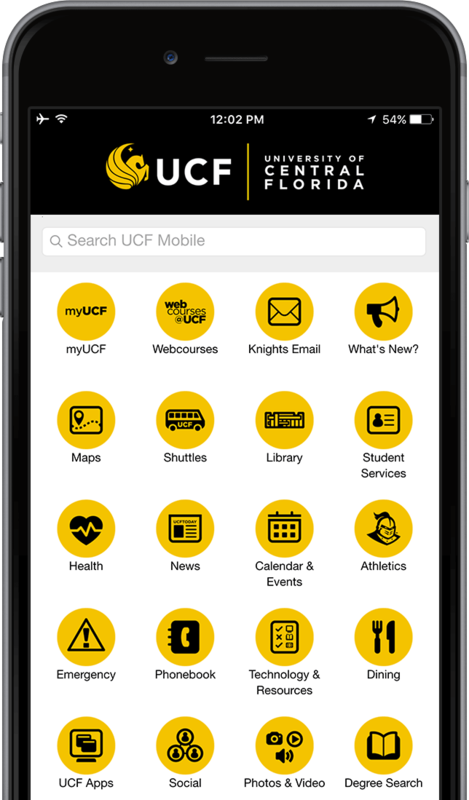 Access popular features of myUCF, quickly connect to your online courses, check your Knights Email, or catch a ride on a campus shuttle. 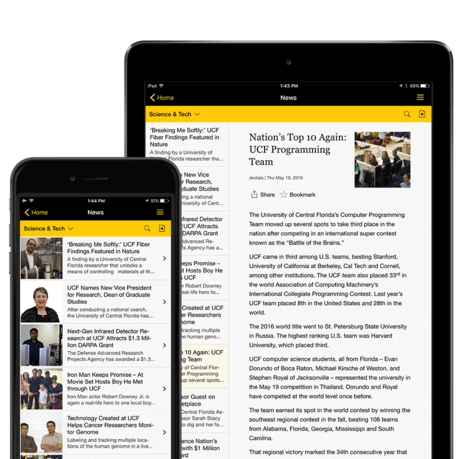 Be informed with the latest in UCF News, events on campus, UCF athletics updates, and emergency information. Find your way with the more than 700 points of interest on the campus map, information about student and health services, dining information and menus, and available technology resources on campus. 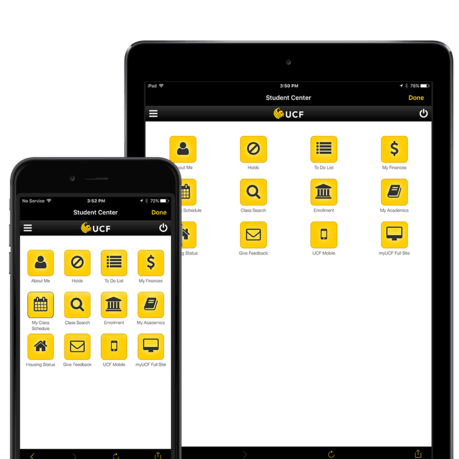 UCF Mobile includes many features to keep you connected while on-the-go. Below is a list of popular resources and services to make the most of the app. Quick access to your To Do List, holds, finances, class schedule, enrollment, personal information, housing status and more. Check grades, view and submit assignments, read announcements and messages, receive push notifications, and more. Check your Knights Email account. Over 700 points of interests that include buildings, departments, services, parking, dining, retail, and much more. Up-to-date information on all UCF shuttle routes. View library catalogs, available resources, and more. Stay up-to-date on what's happening on and around campus with latest news about UCF. Stay in touch with upcoming events happening at UCF. News, schedules, results, social feeds, and media will keep you in the game. Go Knights! Explore the many student services offered by UCF. Schedules and information for the Health Services and Recreation & Wellness Center. Access important emergency information and UCF Alerts. Search for people and organizations at UCF. Find an open computer, room, or other technology on campus. View on-campus dining options, hours, and dining hall menus. 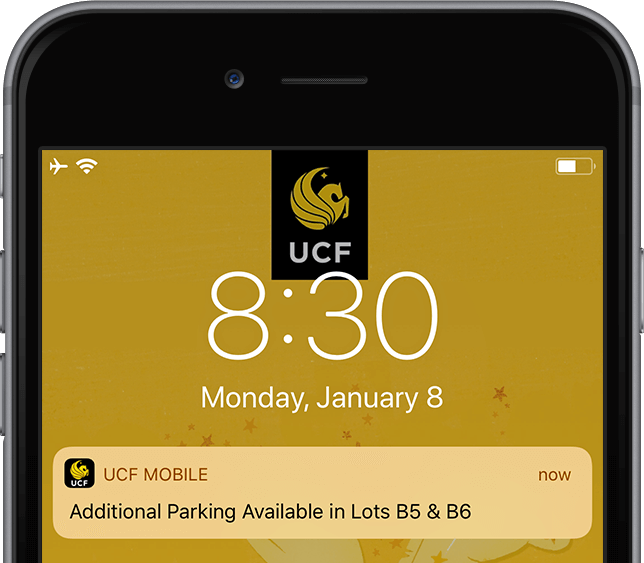 Want UCF notifications delivered directly to your smartphone or tablet? Well, we got you covered. You pick the channels and see what's important to you. Are you a UCF department or entity and want your own channel? Complete the request form.